The title of this page Bicycling in Venice may seem strange as one is not allowed to ride a bicycle in the streets and squares of Venice (Art. 28 of the regulations of the urban police: "also banned in the squares and streets of Venice, is the riding of bicycles and the use of roller skates..."), but the municipality of Venice includes also the islands of the lagoon, some of which have bike routes (Lido, Pellestrina and S. Erasmo), and obviously on the mainland, Mestre and Marghera. 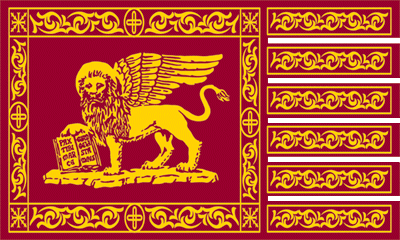 (For routes from Venice into the Veneto, I dedicate a separate page). Possible routes include: to the lighthouse of S. Nicolò (extreme north of the island of the Lido), to the murazzi, going across the islands of the Lido and Pellestrina concluding at the forest and the lighthouse of Ca` Roman; a trip around the island of S. Erasmo, known as «the garden of Venice», and on the mainland, the route through the barene (shoals) of the northern lagoon, ending at Lio Piccolo or the route around the lagoon north of Venice. Fundamental to these routes is the ability to transport your bike on the boats of the ACTV, the agency that provides public transport for Venice. The charge for transporting a bike is 1.00€ to be added to the ticket price per person. The bike service is available on lines 6 and 14 (motorboats serving S. Zaccaria − Lido − Punta Sabbioni), 11 (ferry between the islands of the Lido and Pellestrina), 13 (the vaporetto from Fondamenta Nove to Murano and S. Erasmo), and 17 (the ferry between Tronchetto − Lido).